With Mother’s Day approaching are you looking for an easy-sew gift idea? I love this one, based on the Classic 10-minute Table Runner pattern. It goes so quickly, I couldn’t resist adding embroidery and gems. Leave it to me to turn minutes into a few hours, but well worth the results! First, if you’re not familiar with this sewing pattern, you may want to take a peek at one of the YouTube 10-minute Table Runner videos available online to get an idea of the actual assembly. There are a variety of items you can create with this simple concept of stitching two panels together with a total of four straight seams. It’s just a matter of the size you cut the fabric to produce a table runner, as well as arm chair covers, placemats, napkins and whatever else inspiration brings. Time for sewing is quick, but you will need about 5-6 additional hours for this embellishment, depending on the design that you choose and your placement and hooping technique. 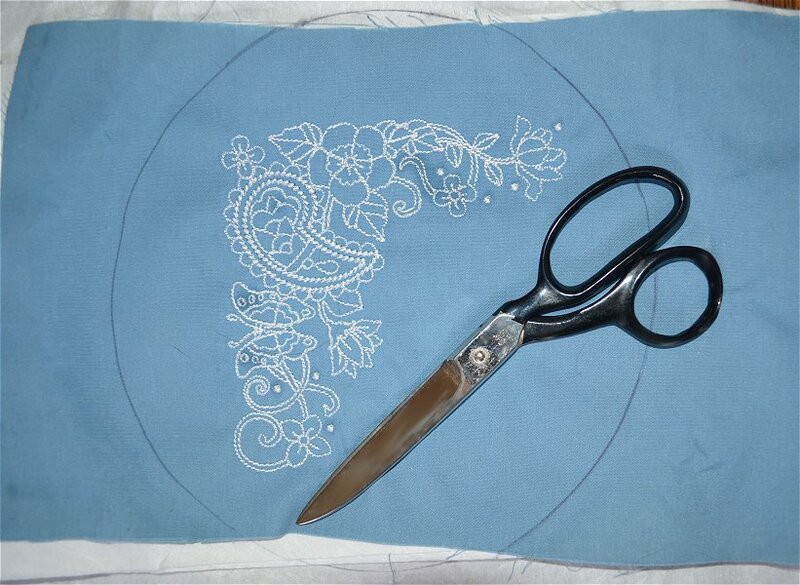 I used a design by Pat Williams, a beautifully digitized paisley pattern that took very little time to stitch, but placement and hooping was a bit tricky using my old school measure-and-eye-ball method. I have to admit, the job would have gone a bit faster had I accurately measured and calculated, and then marked the center or used Design Magazine’s Target Stickers available at EmbroideryDesigns.com. My first thought was to decrease the size of the design slightly to sit nicely balanced in the corner areas of the bottom panel when using the yardage suggested for the 10-minute Table Runner panels of 1/3 yard and 1/2 yard. I could then also use the Baby Lock 5 x 7” hoop, which I felt might accommodate hooping all of the fabric of the corner. I decreased the design hastily, not noticing until after the sew-out that resizing caused the special stitches to disappear, defaulting back to a satin stitch. No, that wouldn’t do. 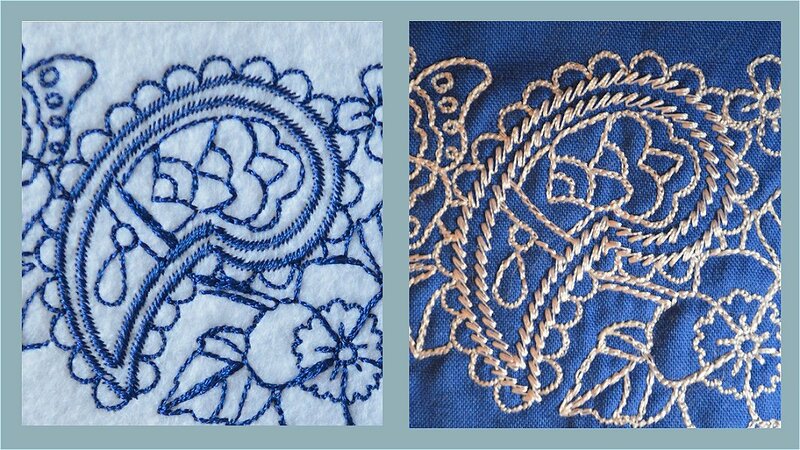 Those beautiful special stitches were relevant if I wanted the design to match the paisley fabric pattern.The image at left has been decreased only 7% and the original size in the final sew-out is at the right. In the end, I decided to use the Tajima Neo and the 8” round hoop, securing one side to the stabilizer with a pin. The size of the design and the measurement of the item you choose to create, will determine the actual placement, but the only thing necessary to achieve balance is to mirror the design appropriate for the corner and make sure that the outside of the design is sewn on each corner the same consistent distance from the two edges. The length of the fabric determines the width of the table runner. The width of the fabric determines the length of the table runner. The fabric width of both panels must be exact. After washing and drying the fabric, double check the fabric width of each panel for shrinkage, and if necessary, trim to the same measurement. 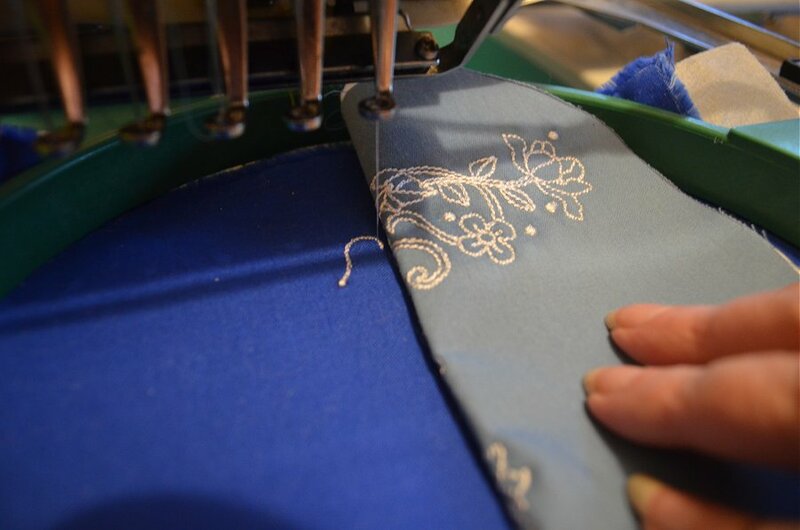 If you don’t check for shrinkage and wait to trim after the embroidery is in place, you will no longer be able to adjust the length so that the ends will meet for a seam, though fortunately when the ends are turned up to create the pocket the inside seam is hidden. If this does occur, you could add on a strip of fabric to extend the top panel. You can also create a longer table runner using the same idea, by doubling the panels and sewing them together along one side, resulting with a seam at the center of the table runner. Create a sample on same or similar type of fabric prior to stitching on the final garment to be sure that you are using the best stabilization. I use two sheets of the lower cost tear-away for testing, which has proven to be sufficient when I plan to use one sheet of poly mesh cut-away on the final garment. Examine the sample and make any adjustments that the sample reveals is necessary, such as correct the tension, clean the bobbin case, change a dull needle or change to a different size needle more appropriate for the fabric and thread weight. As well, if there is an excess of oil from over oiling or it has built up while the machine was idle awhile, the excess will likely be eliminated while stitching the test-sample, and prevent the possibility of soiling the final item (note, my sample reveals a few spots of oil). After stitching the test-sample, mark a guideline around the inside edge of the hoop, and then remove from the hoop and cut out along the guideline. Use the sample to judge placement on the final sew-out. Fold the corners to match up at the inside edge at the center of the panel. Lay the sample on the folded corner with the design placed in the direction it will be stitched. Measure the margin between the fabric edges and the design edge to determine the same measurement you will use for placing the design on each corner. I determined my margins best at 2” between the design and the top of the pocket and 1.5” between the design and center seam. Mark the center of the design with chalk or use a Target Sticker. If you prefer, pin the sample in place to use as a guide when hooping. Double check placement after the first element has sewn. For the mirrored design, set the sample into the hoop with wrong side facing up. Fold back the sample until you can see that the matching element on the stitching in progress is mirrored as accurately as possible from the same point. Finish the run and remove from hoop. Trim away the poly mesh stabilizer near to the edge of the stitches at the outside edge of the design. One reason I choose to use poly mesh cutaway on light weight fabrics is because, unlike tear-away, there’s no chance of stitches or fabric distortion when it’s removed, and when a standard cut-away is used, the cut edges are often revealed on the topside of the embroidery. Poly mesh is strong, yet flexible, and thin enough to remain undetected. If you have chosen to use a different design that would result in a different size, you may need to re-calculate the yardage of fabric to cut for the top panel. 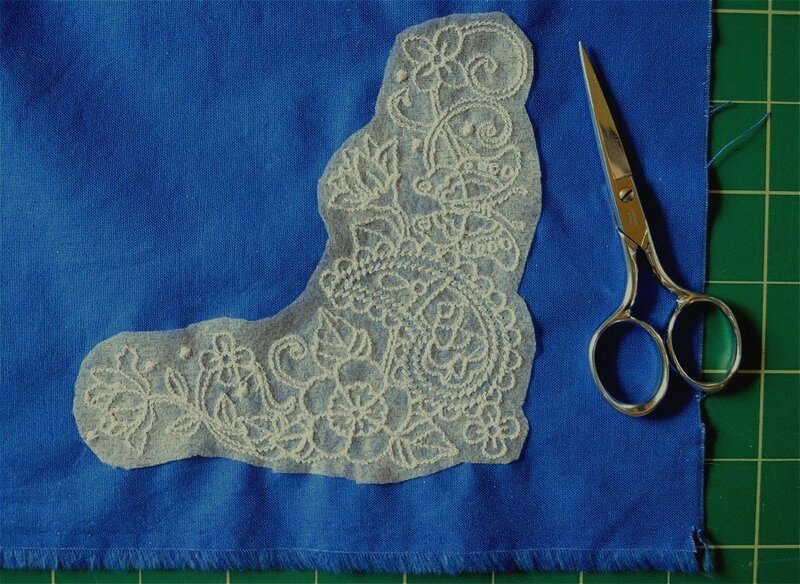 To do so, fold the finished embroidered ends to meet at the center where it will be seamed. 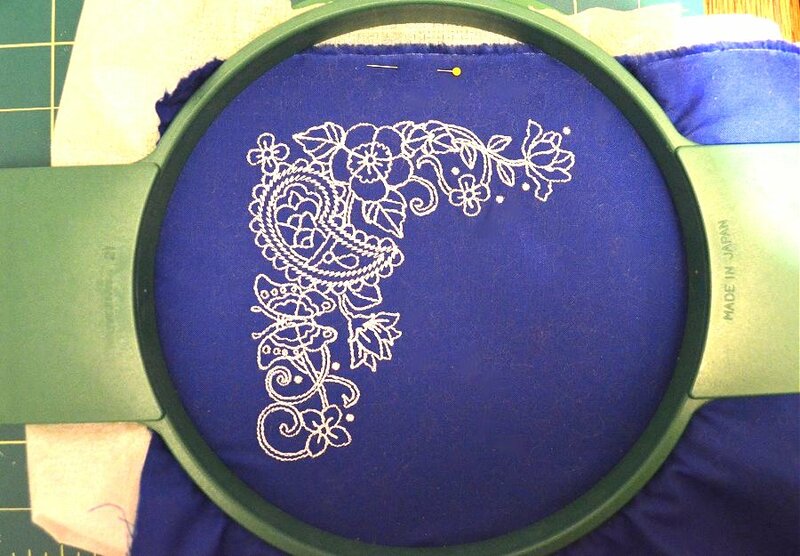 Measure the length of the completed embroidery. 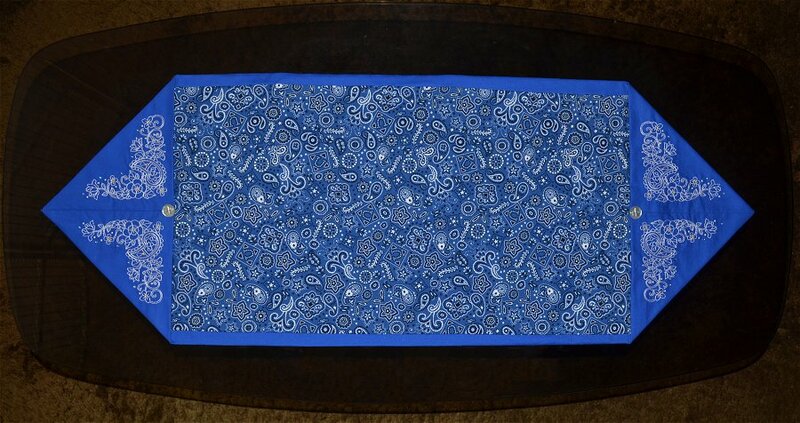 In this project it measures about 10.5” and I wanted the paisley pattern to exceed the boundaries of the design. As well, I planned a 1/2” seam along the sides, so instead of using the classic pattern’s recommendation of 1/3rd yard, I cut the top panel to measure 15”. To make sure that the two panels will assemble properly with the embroidery balanced, lay it out and fold in the seams, finger pressing to create a guide while pinning and stitching. Then, follow the 10-minute pattern: with right sides together, pin if preferred, and stitch the length of both sides. Turn right side out and press. Fold lengthwise with the top panel to the inside and stitch a 1/4” seam at each end. Turn both closed ends by reaching to the inside and pulling out the corner where the end meets the sides to create the V-shaped pocket. If desired, top stitch down the center of the pocket to create two pockets or tack down near the top of the pocket by attaching a button to keep it in place when the pocket is draped over the edge of a table. Press the finished table runner. Attach the gems to the design where desired. I work over a tray lined with a dark piece of fabric that helps see the gems and keeps them from scattering. Use a small drop of glue and set the gem in place. Do not push on the gem, which will cause the glue to push out, leaving very little glue below the gem. If a small excess occurs as seen in this example, do not try to clean it away; if you use a quality adhesive like Gem-Tac, it will dry clear. Let dry 24 hours. Press with the embroidery side down for 30 seconds on a medium setting to heat-set the glue. 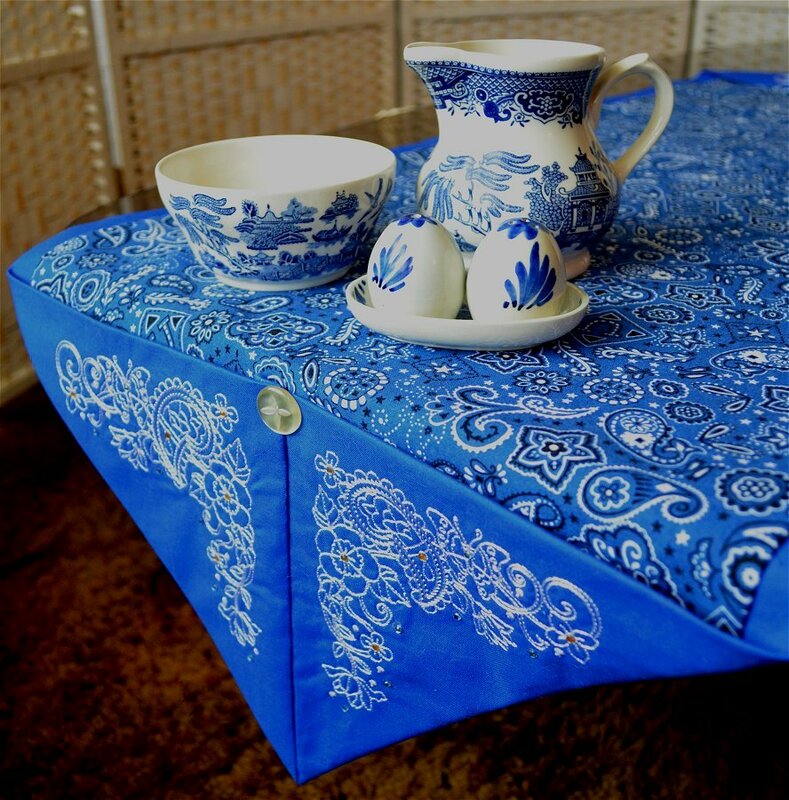 This small table runner can adorn the center of a dining room table, a coffee table or draped over a smaller table so that the pockets can be used to tuck items like a remote control. 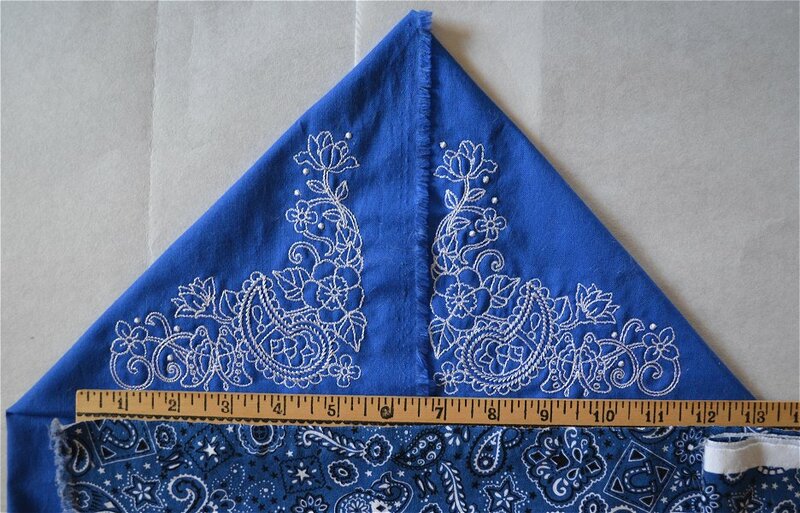 Add a decorative border using one of your machine’s special stitches or attach a tassel on each end. Dig into your stash of trims, buttons and ribbons and let your imagination have some fun! Wishing everyone a wonderful Mother’s Day!